Don Diego is finding that at the age of 53 he cannot perform Zorro's stunts as well as he could in the past. Don Carlos agrees to become Zorro alongside his father in the fight "for justice." He has invented some new methods of fighting injustice which are based on science and technology. Unfortunately, his father would rather him stick to the old methods. Bernardo is Don Diego's servant who is aware of Don Diego's secret. Unlike in previous versions of Zorro, Bernardo can speak and hear. Paco Pico is the new commandante of the pueblo. He finds that the incompetence of his sergeant is hindering him in capturing Zorro. Sgt. Sepulveda is rather dim-witted and frequently forgets things. With little prodding, Zorro is able to convince Sepulveda to reveal everything about Pico's plans. Brothers Napa and Sonoma find themselves frequently at the mercy of Capitán Pico. Corporal Cassette has the ability to record entire conversions in his mind word-for-word just like a cassette player would. 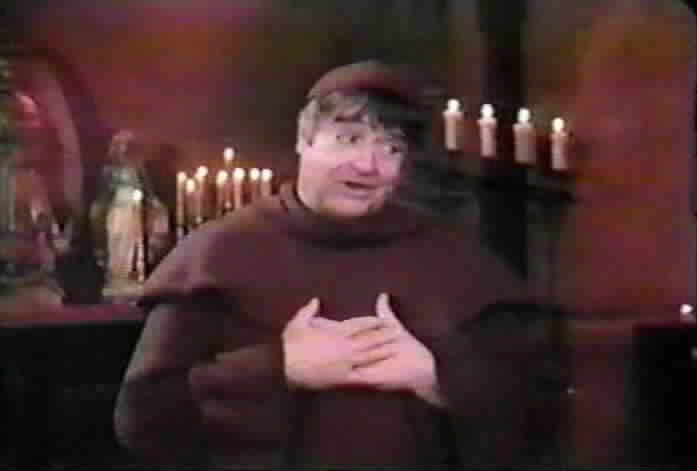 He can recite the conversions rapidly, rewind to a certain point upon demand, and also recite in slow speed. Anita is the ward of Brother Napa. Don Carlos finds her attractive. A petition has been created in hopes of getting Disney to release this television series on DVD. Please follow this link to sign the petition. 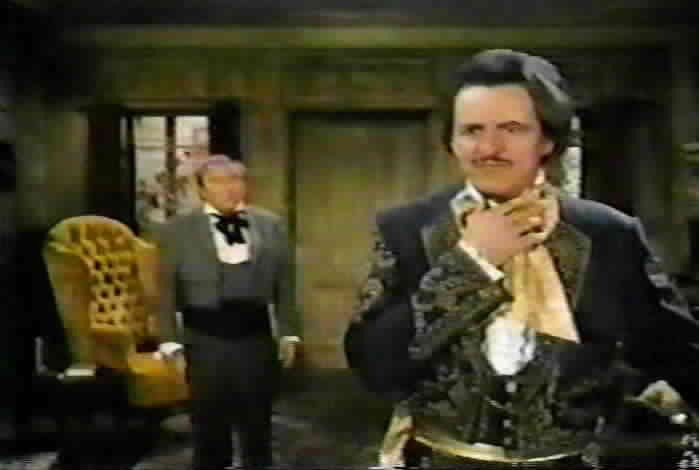 "Beauty and the Mask" "A Fistful of Pesos"
"Wash Day" "The Butcher of Barcelona"
Unlike most other versions of Zorro, this short-lived series is a situation comedy and is the only version of Zorro to have a laugh track. Many of the lines in this series rhyme, are delivered with a certain intonation, and often use alliteration such as "The Black Blight of San Bernadino" or "The Butcher of Barcelona." The humor is mostly slapstick, which causes the series to not appeal much to people who prefer a more serious retelling of the Zorro legend. However, to more open-minded viewers, it is an enjoyable version of Zorro and has some genuinely memorable and amusing moments. During Zorro's appearance at the pueblo's inn, he tries to leap to the chandelier but misses it and falls to the floor. Zorro insists that the chandelier used to be lower and that the innkeeper must have raised it. 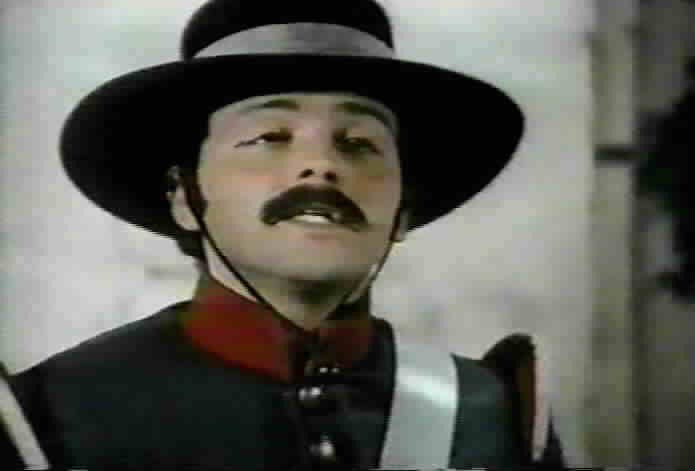 During this scene, Capitán Paco Pico becomes the new commandante of the pueblo. After several weeks have passed, Don Diego finally recovers from the injuries he sustained from Zorro's fall. 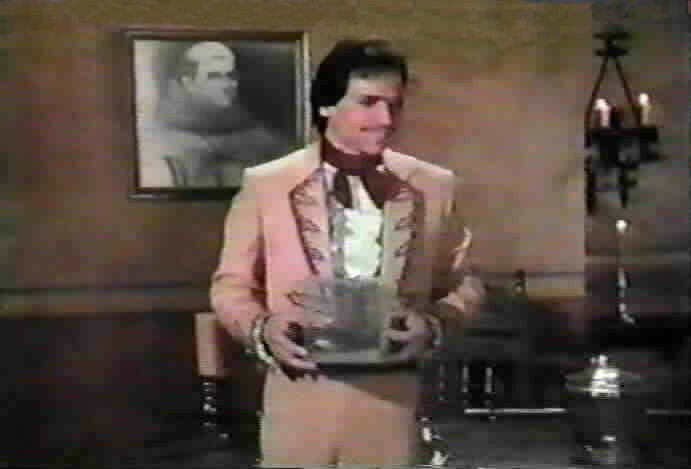 Don Diego's son, Don Carlos, arrives home from Spain inquiring about his father's health. Bernardo had summoned him because Bernardo felt that Zorro needed some help. 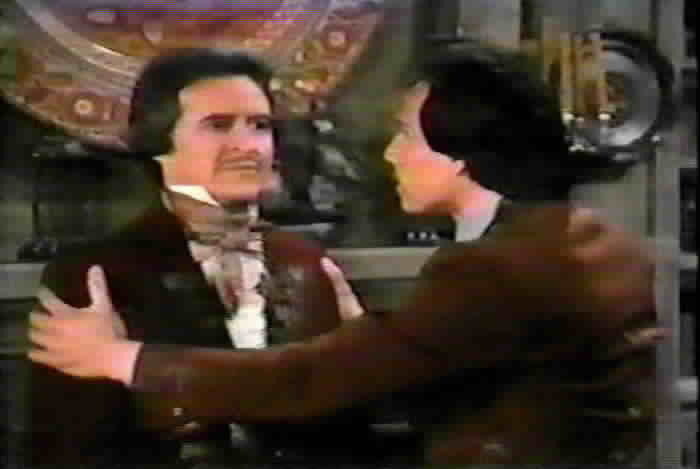 Don Carlos becomes enraged at the arrest of Brother Napa for "selling a wine before its time." 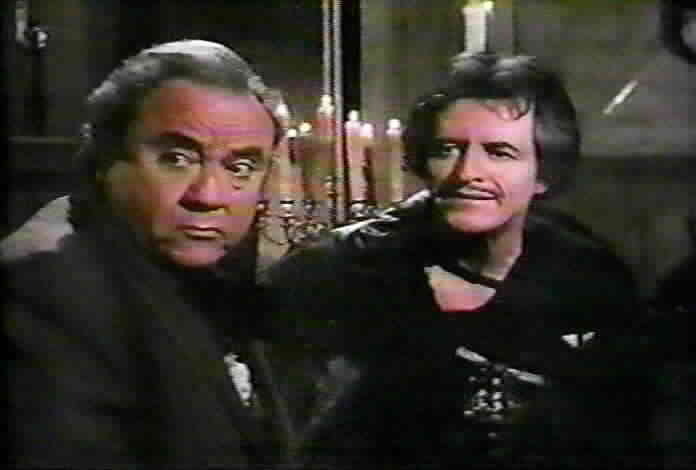 When Don Diego finds out that Don Carlos is interested in fighting for justice, he reveals to his son that he is Zorro. Don Carlos also takes on the mask of Zorro and fights with his father for justice. Although father and son are united in their fight for justice, they disagree on how they should fight the battle. Don Diego wishes to keep with the old ways and use only his sword while Don Carlos prefers to use more advanced techniques such as explosives and onion gas to free Brother Napa. The new ideas created by Don Carlos save the day when Don Diego finds himself cornered by the soldiers during the rescue of Brother Napa. 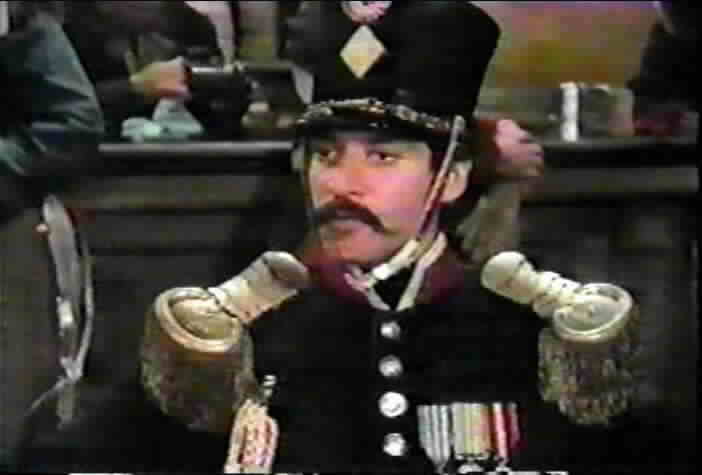 Don Carlos releases the onion gas which enables both men to rescue Brother Napa and his ward Anita, who had later been arrested, and to escape successfully. 2. "Beauty and the Mask"
A dancer named Angelica is suspected of smuggling guns to the rebels. Angelica escapes and first seeks refuge at the mission, where Don Carlos is teaching the sciences to the children. Angelica leaves quickly because the soldiers are coming after her. Don Carlos is so enamored with Angelica that he vows to help her. 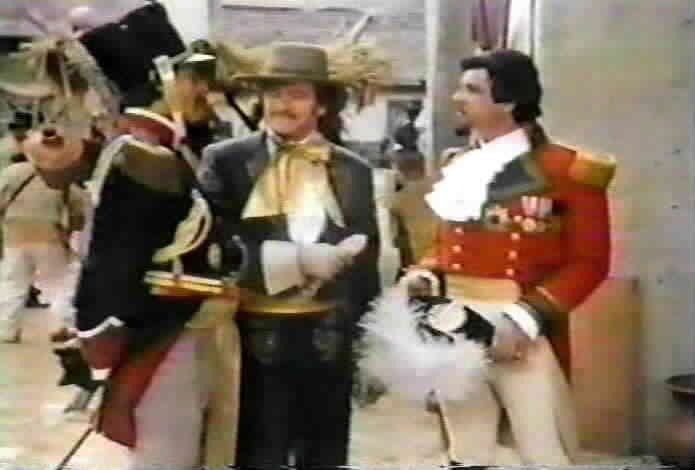 The soldiers catch up with Angelica, but unfortunately for them, Don Carlos arrives dressed as Zorro. He rescues her and takes her to the Vega hacienda. 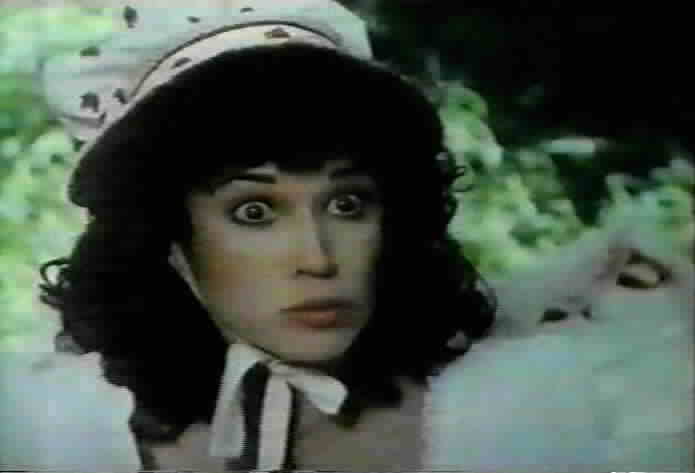 Capitán Pico quickly discovers that Angelica is hiding at the Vega hacienda. The capitán threatens Angelica that he will harm her mother who lives in Mexico City unless she turns informant against Zorro. Don Carlos, once again disguised as Zorro, rescues Angelica from Pico and then takes her to the secret cave. While in the cave, he suggests to Angelica that Don Carlos would be a good suitor; to the dismay of Don Carlos, Angelica laughs. 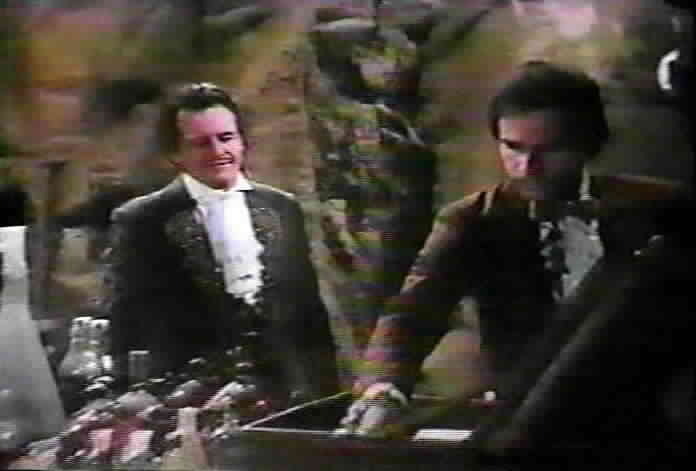 Later, Don Carlos brings Angelica roses as Zorro and has dinner with her in the cave. Don Carlos is about to share his secret with her when Angelina breaks in and tells him that she is a spy for the capitán. After Zorro learns that Pico threatened to harm Angelica's mother, he swears that he will make certain that she and her mother are safe. Meanwhile, Don Diego, disguised as Zorro, rides all the way to Mexico City and back in one night, bringing back Angelica's mother. Angelica is glad that her mother is safe and tells Don Carlos, who is again dressed as Zorro, that she will once again join the rebels. 3. "A Fistful of Pesos"
Capitán Pico decides that the best way to get rid of Zorro will be if he can discredit Zorro's name. Capitán Pico disguises himself as Zorro and robs the people of the pueblo which does turn the people against Zorro. When Don Diego responds to a call for help as Zorro, he cannot understand why the people attack him until he discovers that Zorro has been robbing the people. After Don Diego discovers that Don Carlos has accumulated some gambling debts, he becomes convinced that Don Carlos is the Zorro who is robbing the people. 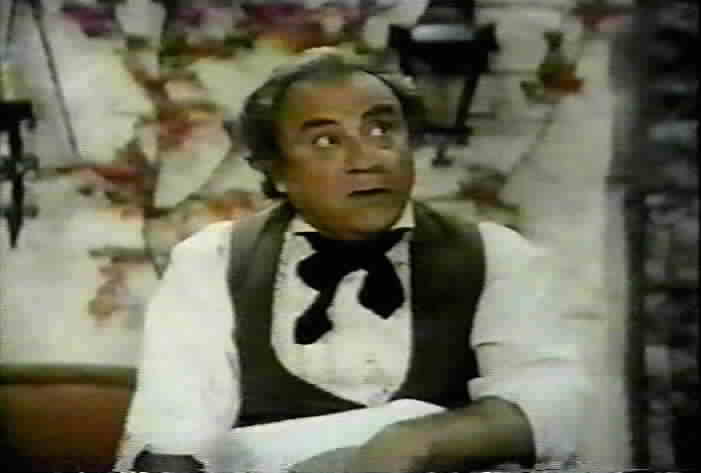 Don Diego accuses Don Carlos of the robberies. 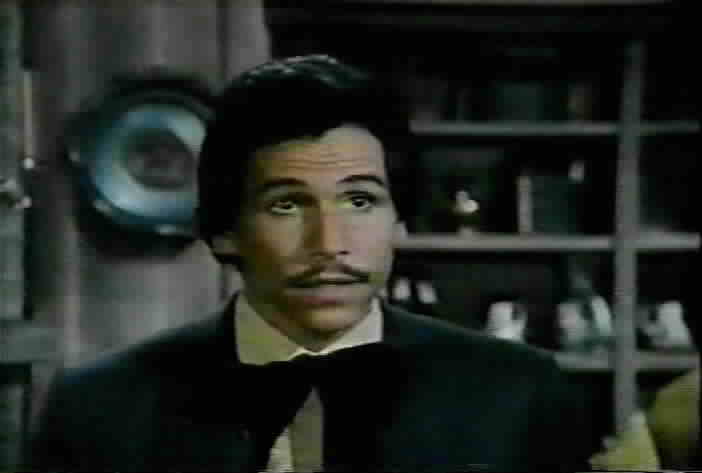 Don Carlos is angered by the accusation and cannot believe that his own father does not trust him; he vehemently denies that he is the fake Zorro, and vows to reveal the identity of the fake Zorro. 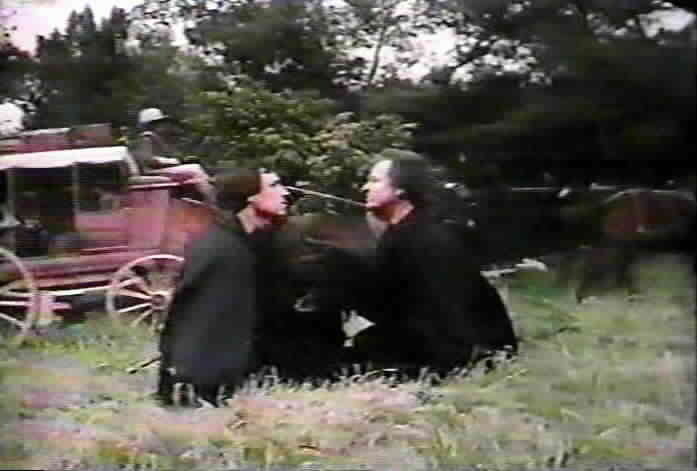 Both Don Diego and Don Carlos believe that the stagecoach will be robbed by the fake Zorro but are unable to prevent the robbery; they are too busy arguing over who should be the one to avenge Zorro's name. Finally, both men decide to work together to capture the fake Zorro. 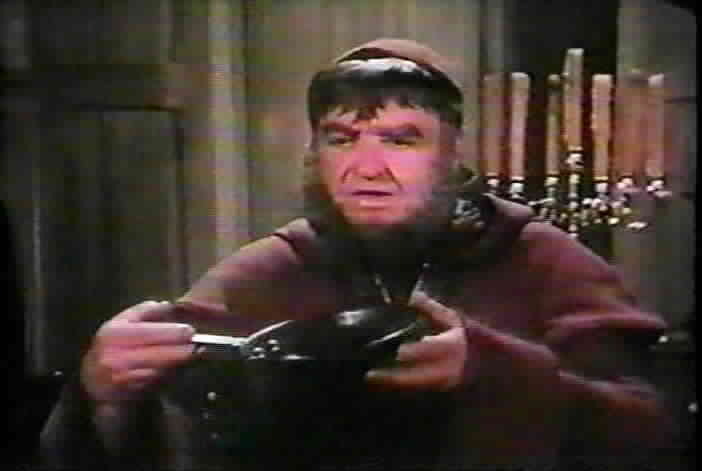 Don Diego convinces Brother Sonoma to bring the church's sacred skillet to his hacienda for safekeeping. 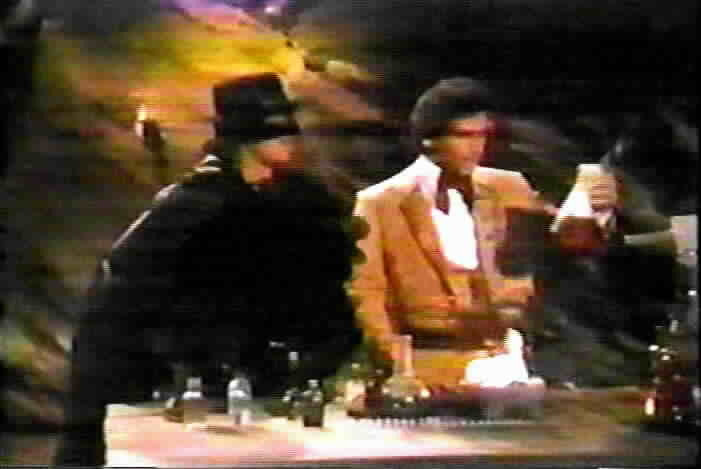 The fake Zorro rises to the bait, and is thwarted when Don Diego appears dressed as Zorro. 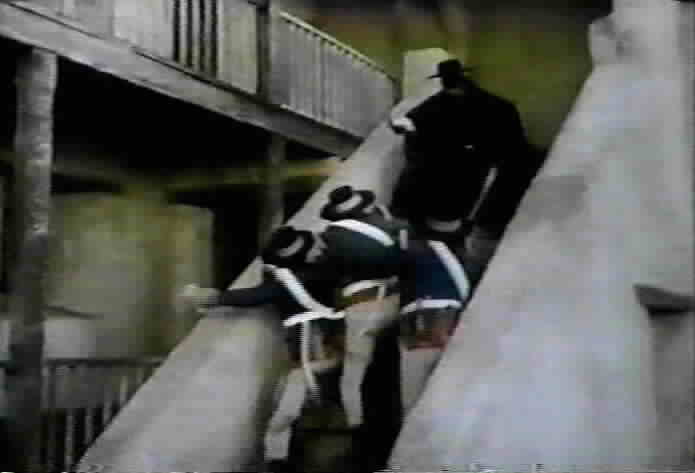 The soldiers arrive while Zorro and the fake Zorro are fighting. The real Zorro is able to trick the soldiers into arresting the fake Zorro and is able to escape. Zorro's name is cleared as the people now know that the capitán was posing as Zorro. Bernardo washes Zorro's disguise and hangs the clothes on his secret clothesline. An unexpected gust of wind blows the clothes from the clothesline and right into the hands of Capitán Pico. 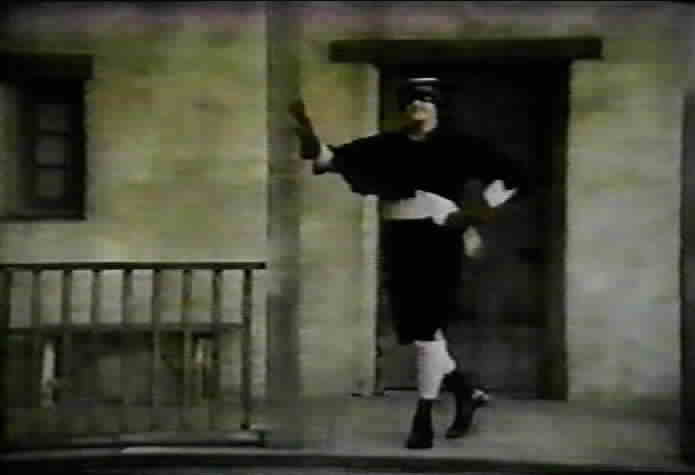 Bernardo comes rushing after the clothes and is promptly arrested by Capitán Pico who suspects that Don Diego is Zorro. Don Diego is brought into the pueblo for questioning. Capitán Pico forces Don Diego to dress in the confiscated clothes. Fortunately for Don Diego, the clothes have shrunk so it appears that Don Diego cannot be Zorro. When Capitán Pico tries to force Bernardo to reveal Zorro's identity, Bernardo confesses that he is Zorro. 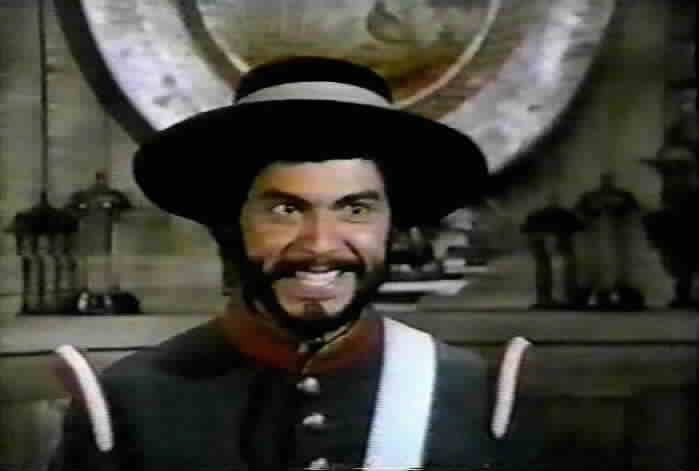 Capitán Pico releases Don Diego. Don Diego and Don Carlos wish to help Bernardo, but are unable to do so since they no longer have the Zorro disguise. 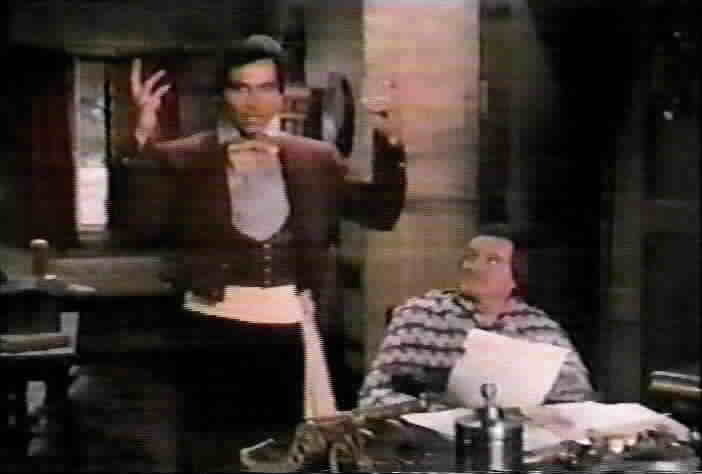 Don Diego and Don Carlos are informed by Sergeant Sepulveda that he has altered Zorro's shrunken clothes and that the clothes are back to the correct size. Sepulveda reveals that the clothes are hidden in the pueblo but does not reveal the exact location. Don Diego appears for Bernardo's execution while Don Carlos frantically searches for the garments. 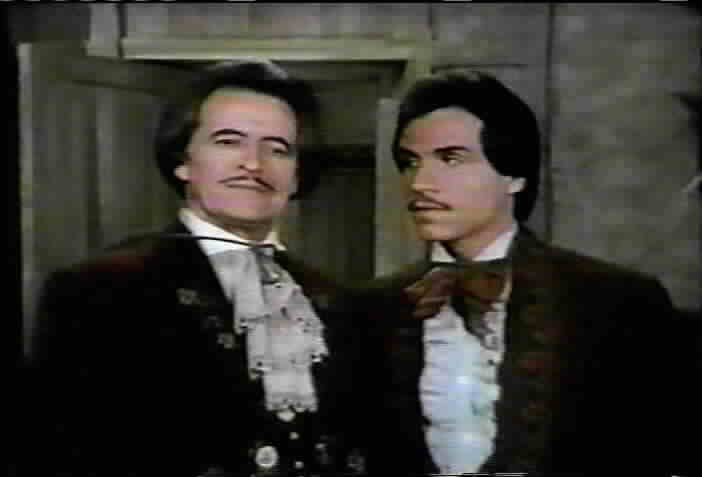 Fortunately, Don Carlos finds the disguise and appears just in time to rescue Bernardo from hanging, and Don Diego's presence proves that Don Diego cannot be Zorro. 5. 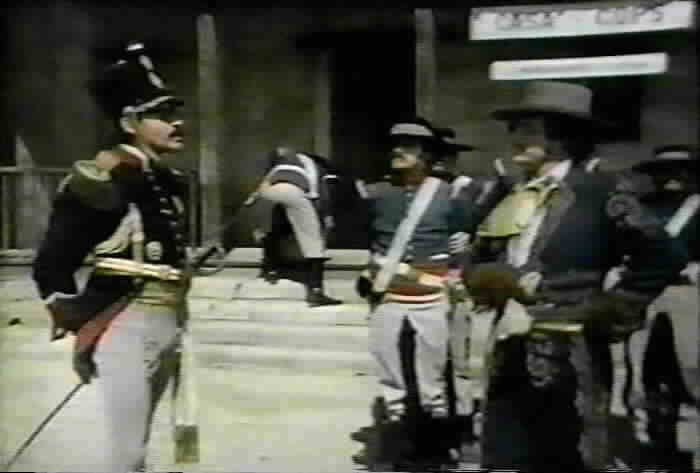 "The Butcher of Barcelona"
Sergeant Sepulveda informs Capitán Pico that El Excelente will be arriving shortly to inspect the pueblo. Capitán Pico is worried because El Excelente has always considered him "soft on crime." El Excelente is accompanied by Capitán Jorge Mendez, also known as the "Butcher of Barcelona." Don Diego is displeased to hear of the presence of Mendez because he has an old grudge against Mendez. Capitán Pico fears that he will lose his office so he asks for Don Diego's help. Don Diego agrees, since he would rather have Pico in charge than Mendez. Don Diego appears with the capitán in the pueblo to show his support and friendship, which impresses El Excelente. 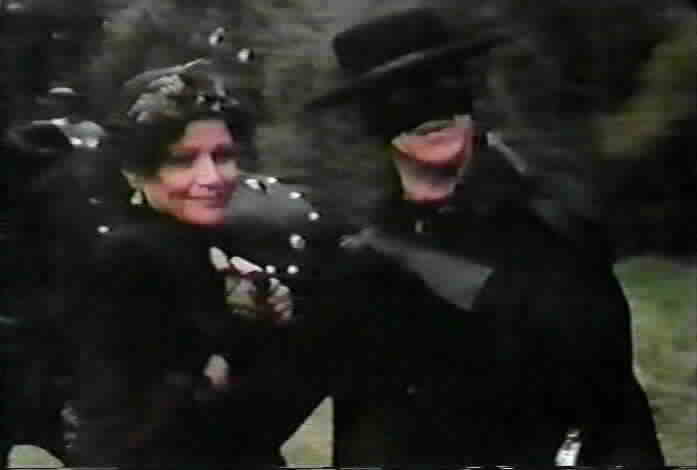 Unfortunately, Brother Napa is being mistreated by the soldiers and Don Carlos appears as Zorro to stop the injustice. 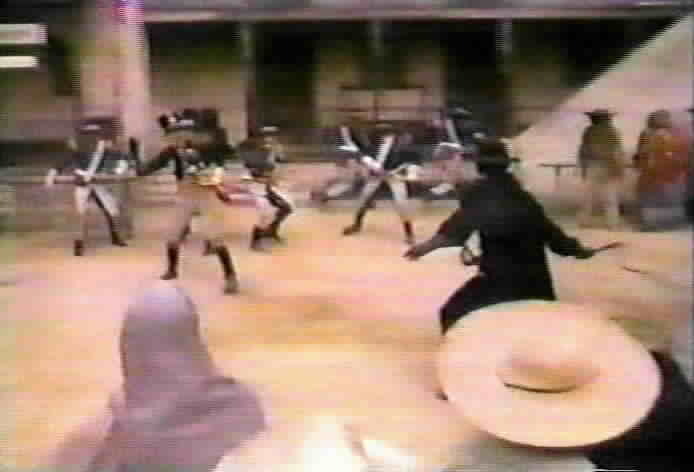 Since El Excelente is enraged at the appearance of Zorro, he fires Pico in retaliation, and names Mendez as capitán of the pueblo. Don Diego must intervene in order to get Pico reinstated to his position. Don Diego talks to El Excelente and is able to get him to agree to restate Pico in his position if Zorro is captured by the next day. Carlos is asked to pretend to be Zorro and be defeated by Pico. 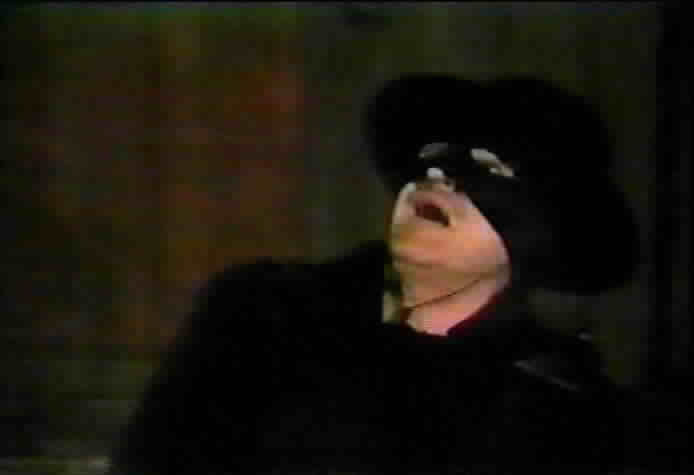 Instead, Mendez jumps into the battle and is defeated by Zorro. El Excelente is disgusted with Mendez and decides to keep Pico in the position of commandante of the pueblo. 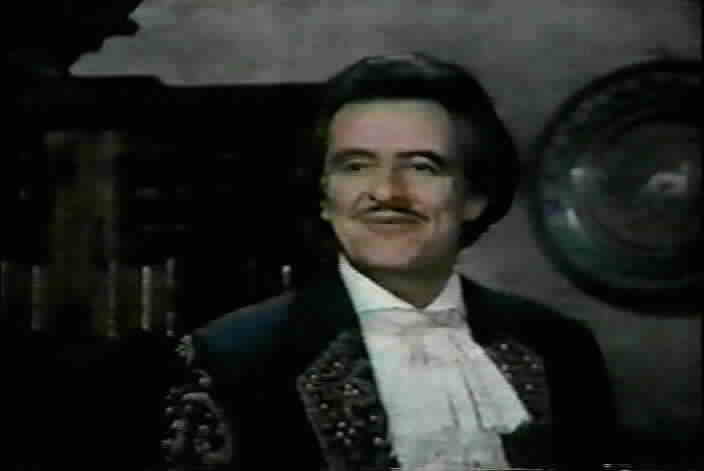 Henry Darrow is the only person to have a starring role in three versions of Zorro: the 1981 animated series, the Zorro and Son series, and the New World Zorro series. 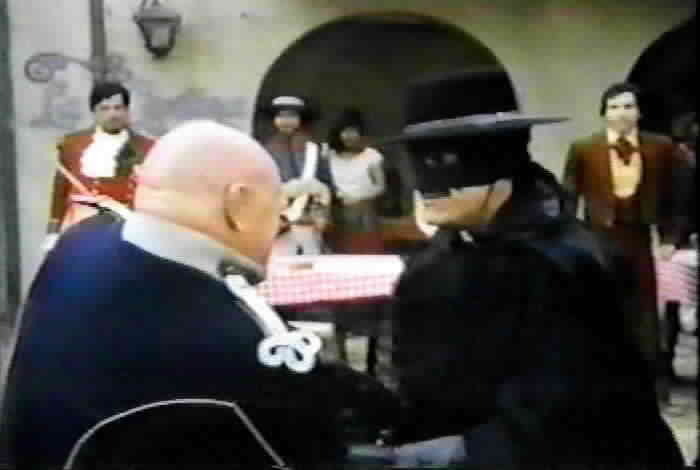 This series used the exterior sets and costumes from the 1950s Disney Zorro series. The theme music is an adaptation of the theme from the Disney series. The end credits show Zorro's hat, mask, and sword on a red background much like what was shown during the credits of Zorro, the Gay Blade. Between scenes a red "Z" is cut and then breaks apart and swirls; this feature is reminiscent of the spinning Bat symbol which was used in the 1960s Batman television series. Zorro is a registered trademark of Zorro Productions, Inc. This site is an unofficial site and is neither affiliated with nor endorsed by Zorro Productions, Inc. Any copyrighted material appearing on this site complies with fair or acceptable use principles established in U.S. and International copyright law for the purpose of review, study, criticism, or news reporting. Page design and original content are copyright © 2003 by Jennifer White.